The plaques are on display at the WW1 Remembrance Centre, Fort Widley - on Portsdown Hill. 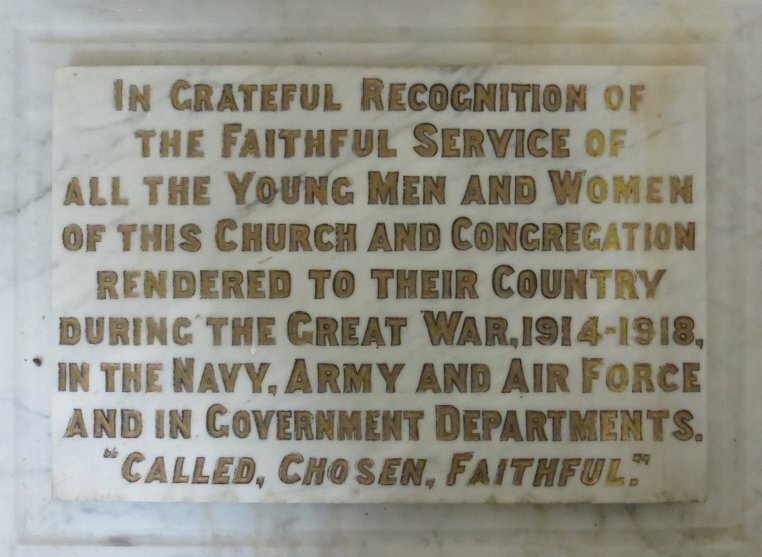 The two plaques are shown together though there is no direct connection between them apart from the fact that they were both rescued from the Congregational Church, Victoria Road South, Southsea (opposite the junction with Albert Road). 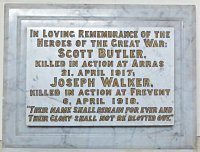 THEIR GLORY SHALL NOT BE BLOTTED OUT"
The Commonwealth War Graves Commission lists Private Butler, S. (DM2/134749), serving in the Army Service Corps, died 21/04/1917, aged 25. Buried at St. Nicholas British Cemetery (Grave Ref: I.G.7.). Son of Uriah and Julia Butler, of 55, Chelsea Rd., Southsea, Hants. 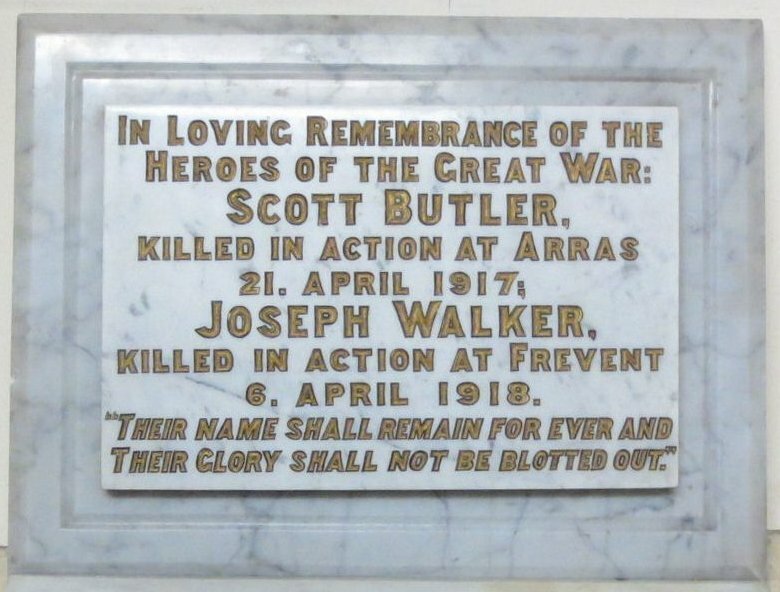 Scott Butler is also remembered on the Cenotaph, Guildhall Square. The Butler family had arrived in Portsmouth from Jersey in the first few years of the 20th century. The head of the family, Uriah Butler, a mariner had died a few years earlier, leaving his widow Julia and two children, Lilian and Scott, to find their feet in a new town. It's not known what brought them to Portsmouth but they certainly didn't arrive in a penniless state as their house in Chelsea Road was rather large (7 rooms). Scott Butler was listed as Uriah Butler in the 1901 Census but changed his name to Scott in time for the 1911 Census when he was recorded as a 'House Furnisher'. He would have been 22 years old at the outbreak of the Great War but we don't know when he enlisted, nor the circumstances of his death. The Commonwealth War Graves Commission lists Lance Corporal Joseph Alexander Walker (723497), serving in the 24th Battalion, London Regiment, died 06/04/1918, aged 26. Buried at St. Hilaire Cemetery Extension, Frevent (Grave Ref: B.8.). Awarded the Military Medal. Son of Joseph Alexander Walker and Kate Eliza Walker, of 153, Albert Rd., Southsea, Portsmouth. Joseph Walker is also remembered on the Cenotaph, Guildhall Square. In the 1911 Census, Joseph Alexander Walker snr. was listed as the manager of Lloyds Bank, 153 Albert Road, Southsea at the junction with Harold Road. His son, Joseph jnr. was recorded as a bank clerk, presumably at his father's bank. His mother was Kate Eliza Walker. They were all living 'above the shop'. He would have been 22 years old at the outbreak of the Great War but we don't know when he enlisted, nor the circumstances of his death, though it was very probably at the 6th Stationary Hospital.